I tried setting up SSH Access from cPanel first time last week and it worked seamlessly without any issue. I was able to login and execute some commands to check higher CPU usage and memory issue. Last week at Crunchify, LLC we were debugging higher CPU issue and wanted to have login access to our hosting server. We are hosted at Squidix web hosting and so far it’s working very well. By the way, as of now, higher CPU issue is resolved. It was related to Disqus and you could find all detailed information here on Github official Issue #118 page. In this tutorial we will go over step by step how to setup SSH on your Macbook or Desktop correct way to access your VM (Virtual Machine) /Physical host. What is SSH Access in cPanel? Can I login to my Shared Hosting VM using SSH Access? 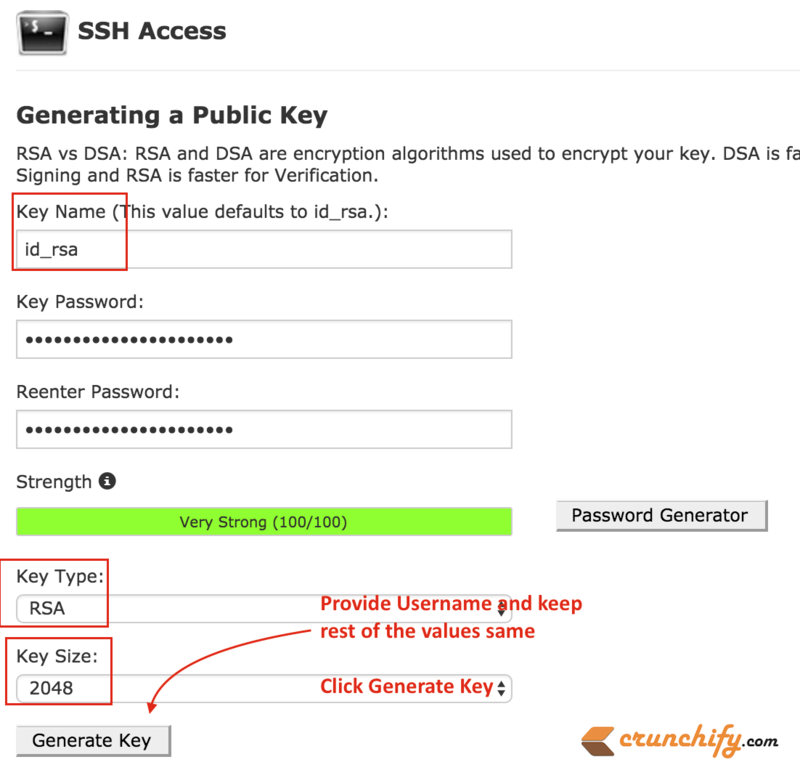 Your Key will be generated successfully and it will be saved under your cPanel account under /home/crunchify/.ssh/ folder. Click on Go Back link. By default Public Key wont be authorized. You need to Authorize Key by clicking Manage button and then Authorize button in next screen. Now Download your Private Key id_rsa. It will download your key to ~/Downloads/ folder on Macbook pro (I’m using Mac). You will be asked to add host. RSA key fingerprint will be added to known_hosts. NOTE: Below SSH and RSA information has been modified already for security reason. Try executing each commands in sequence. The authenticity of host '45.56.17.128 (45.56.17.128)' can't be established. RSA key fingerprint is SHA256:aVZRglGWYnV1sdfsd#$@#@WvK9fsqmjuBIE7Vek. You will now be logged into your account via SSH. This works across any hosting provider and any plan you are on. 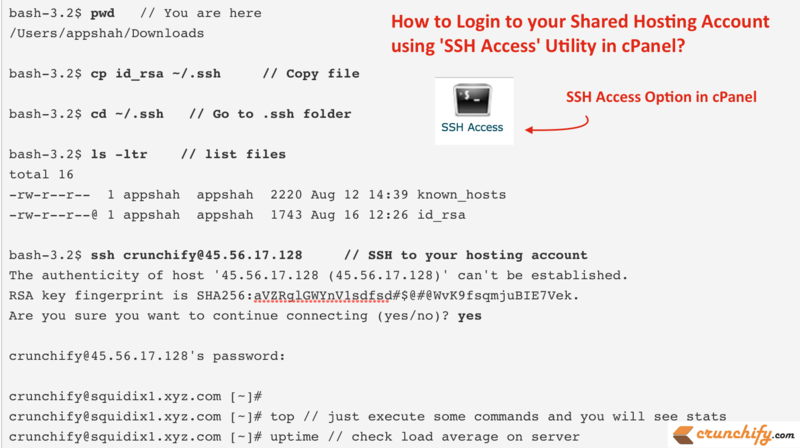 This is a universal method to login to your hosting account using SSH.